Royalty Masters now sits on the throne for the first time as the new kings of the Banks Barbados International Masters Football Festival after edging Brooklyn Central 3-2 on penalty kicks at the Wanderers ground yesterday. After four exciting days of football action that featured 24 overseas teams including first- time visitors Republika Srpska made up of Serbians and Croatians, fans turned out in their large numbers to witness the grand final. Unfortunately for local supporters last year’s champions Wildey Masters only made it as far as the semi-final this time but Royalty played like champions to reach the final where they treated spectators to a keenly contested encounter that was played over two halves of 30 minutes each. Brooklyn Central out of the United States took the lead off a set piece when a free kick was taken, cushioned by a header and then a brilliant right foot shot from inside the box by Sean John flashed past custodian Kenmore Rouse in the 15th minute. That certainly silenced the crowd but not for too long because five minutes later they found the equalizer thanks to great work from Luther Watson down the right flank. He took on two defenders and beat them both on the dribble with a square ball to Jerry Alexander who finished with a right-foot strike. At half-time the score remained 1-1 and that stalemate would remain into the second half even though Royalty in their Barcelona-type uniforms created a few goal scoring opportunities that were either well defended or met by superb saves by Brooklyn’s goalkeeper Clayton Ince. Ince is a former national keeper for Trinidad and Tobago. 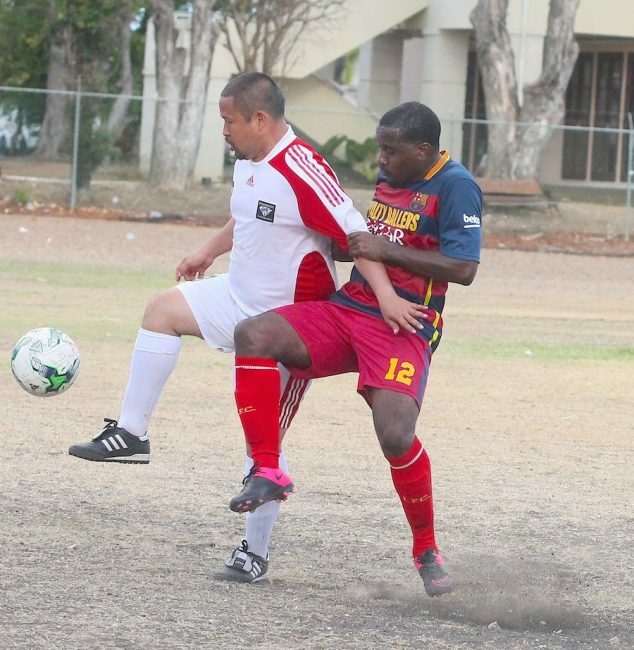 Captain of Royalty Masters Michael Forde (right) locked in battle with Brooklyn Central’s midfielder Kevin Moo Young. This resulted in the game going into a penalty shoot-out under the supervision of referee Adrian Goddard. Royalty’s match-winning penalty kicks came through Michael Forde, Jerry Alexander and Travis McPherson who scored the third and final kick. Credit must be given also to Royalty’s keeper Rouse who made two fantastic saves at the start of the penalty shoot-out. Forde who captained Royalty to their first ever masters title told Barbados TODAY after the match they had been kicking at the door for the past years and having been unsuccessful at the knockout stages each time they made a vow to reach the final this year. “We have a lot of young players that are forty to forty-one years old and this year we came up with a plan to be united, cut out all the quarrelling and bickering and concentrate on our football. Because we are a talented bunch of men who represented Barbados and this team we played here today in the final in my opinion only played for penalties because they have an ex national Trinidad and Tobago goal-keeper who was very good in the other preliminary matches saving penalties. So they were definitely looking for a draw and even though he [Brooklyn goalkeeper Clayton Ince] made a few good saves in the game we were confident in our penalties and nothing was going to stop us from winning,” said an elated Forde who won an award for the most goals. Royalty also captured two other awards through Elvin Griffith who was adjudged man-of-the-match and teammate Wayne Hunte was voted most valuable player of the tournament. National Unity won the inaugural over-50 while Bayland Masters won the plate final 1-0 over Eden Stars. Trinidad Defence Force took away what is called the SET award and that is given to the team that socialized the most during the festival.